Sara has always been fascinated with how animals communicate and has dedicated a lifetime to learning, interpreting and understanding animal behavior. Determined to seek out accurate information supported by science and the world’s leading animal behavior experts and to help broaden her knowledge and experience, Sara has undertaken many recognized certificate courses, workshops and seminars gaining international educational certification and professional working experience in Europe, the United States and Australia. Sara is a Certified Companion Animal Behaviorist and a Professional Dog Trainer with over 10 years of animal training and behavior consulting experience. She is also accredited by The Certification Council for Professional Dog Trainers and holds professional memberships to The Association of Pet Dog Trainers and The Pet Professional Guild. 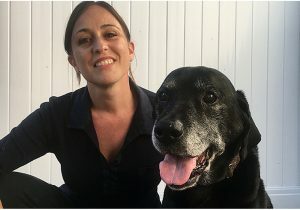 Sara’s professional work history includes starting and operating a professional Dog Training, Boarding & Behavior Consultancy business in Ireland where over the years she successfully developed the business through veterinary and client referrals. Using modern training methods and behavior modification techniques Sara created specialized Training Plans for dogs with Behavior Problems, tailored Training Packages for Puppy Training & Socialization, Obedience Training and for Board & Train students as well as prepared the curriculum for all Group Training classes. Sara has also worked as a Service Dog Trainer assessing puppies and training task work, testing potential pet dogs and their handlers for various non profit programs and has volunteered her time at various animal shelters and non profit service dog providers. Throughout her career Sara has worked with many different breeds of dog and species of animal including birds, cats, rabbits, horses, pigs and big cats. Having relocated to Los Angeles Sara is excited to join the team at spcaLA and is looking forward to applying her skills, knowledge and expertise to help develop existing programs and to implement new initiatives. Also, to work directly with the shelter animals to incorporate the latest developments in applied animal learning to modify behavior to improve adoptability and, to prevent relinquishment and increase long term placement through educational initiatives.